Mental Health Issues - PG3 (Permission Granted) Ministry. Women"s Conference Speaker - "Women In Step with the Word - Looking In the Mirror"
Barbra heart's desire is to know Christ intimately and to be an instrument used by God and stirring the same desire in others with every beat of her heart. Her greatest aspiration and fulfillment is sharing the uncompromising truths of Scripture to women of all ages to not only know the Word of God intellectually, but experience it practically by the power of the Holy Spirit. Her calling is to encourage women to hunger for a closer walk with Jesus Christ. She wants women to know their needs and desires can only be gratified by a life totally abandoned to self and devoted to Him. My life's verse is Acts 20:24: "However, I consider my life worth nothing to me, if only I may finish the race and complete the task the Lord Jesus had given me, the task of testifying to the gospel of God's grace." Barbra graduated from Dunbar High School. She received B.A. in Human Services from the University of Detroit and a M.A. in Christian Education from Michigan Theological Seminary, now (Moody Theological Seminary - Michigan.) Barbra is a Registered Nurse from the Methodist Hospital of Nursing, Lubbock, Texas, and licensed state of Michigan. Barbra is the founder and CEO of Heart Expressions Ministries International, a faith-based ministry, devoted to reaching the heart of women one-beat at a time, to live lives expressing the heartbeat of God. She is President of the Royal Ambassadors for Christ, a Christian outreach ministry involved in reaching the loss for Christ. She traveled as a missionary to Senegal West Africa as a representative of (RAFC.) She is co-founder of PG3 Ministry designed to encourage the honest expression of emotional struggles so people can experience the power of God's help, hope and healing by dispelling mental health myths with biblical perspectives. Barbra is a Certified Biblical Counselor and adjunct professor with the Christian Research and Development; where she teaches classes that will prepare students to confront themselves, resolve their own problems, and counsel others using the Bible as their textbook to change lives for God's glory. She currently works as a Clinical Coordinator with a local agency. Barbra is a member of the National Biblical Counseling Association (NBCA), and the Lydia Circle of Business Professional Women, Vice-President of the Board for Women Who Inspire, National Biblical Counseling Association (NBCA), She is a member of Triumph Church under the under the pastoralship of Rev. Solomon W. Kinloch, Jr., and serves on the Christian Maturity Ministry where she is involved in teaches classes and facilitating small groups. 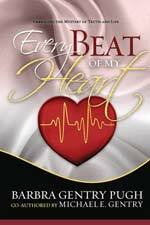 Barbra's first book project "Every Beat of My Heart" scheduled to be released August, 2015, sharing prescriptions for the physical, emotional, and spiritual blockage that hinders the Source of life which flows from the heartbeat of God. Barbra is the past host of the Barbra Gentry-Pugh Show, show now Heart Expressions with Barbra. The show provides a wide range of information to assist in bringing balance and wholeness of the body, mind and spirit as well as to introducing and supporting Christian business and professional women entrepreneurs. Barbra is available for speaking engagements; conference speaker, seminars, worship leader and panel discussions.